As any online gamer knows, having an optimal connection is the difference between getting your pwnage on or getting pwned. This is especially true for gamers who are using a wireless connection. Dropped signals, interference and other factors are the typical performance hindering culprits. 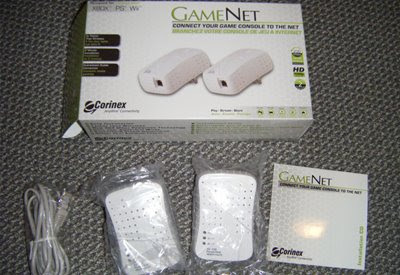 To help us wireless online gamers avoid these connection pitfalls, a company called Corinex (based out of Vancouver, BC) has released a product called GameNet. 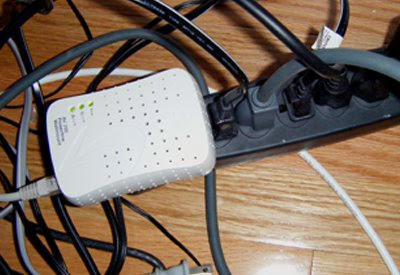 GameNet works by using your home's electrical powerline to carry an internet signal from your modem/router directly to your gaming console or PC and thus eliminate the need for a wireless connection. Corinex boasts that the GameNet will give you speeds up to 4 times faster than wireless and also a lag-free online gaming experience. These are pretty big claims. To back up their claims, Corinex kindly provided the NextGen Player team with their GameNet product so that we could put it through our rigorous testing procedures. Testing Phase 1 - Unpacking the product. Setting up both GameNet adapters was a breeze. I took one of the adapters and plugged it into the wall's electrical outlet. 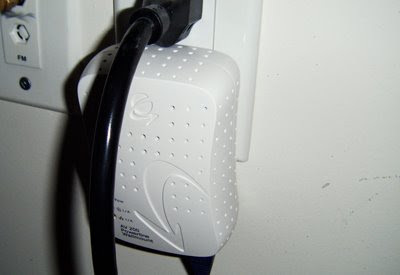 With one of the ethernet cables, I connected this adapter to my wireless router. The other adapter was plugged into my electrical power bar and using the other ethernet cable, connected this unit to my PlayStation 3. Simple enough. I turned on my PS3 and ran through my network connection set up. Here would begin the true set up test of the GameNet device. I was very impressed. 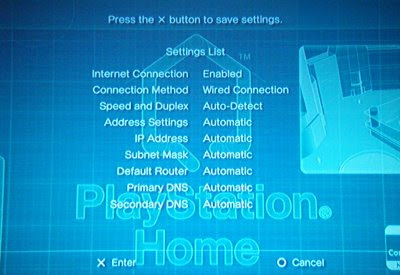 I changed my PS3 connection setting from wireless to wired and the auto detection and configuration executed without any issues. I didn't even have to use the installation CD. This is definitely an easy plug and play set up. Testing Phase 4 - Play online - Time to get my PWNAGE on! So I threw in my Metal Gear Solid 4 for some online aggression. As I navigated through the game's online play menu and started searching for a game in the free play mode, it brought up a list of games immediately. From there I selected a game to join. I made sure I selected a game with the max no. of players allowed at 16. I played for about a good hour or so and throughout the entire time I did not experience any lag or even slow down at all. The game controls were responsive and there weren't any instances of delay. The connection was as good as a direct wired internet connection and felt more stable then playing via a wireless connection. My overall impression of the GameNet product is very good. Set up was plug and play easy and quick. Performance was everything that the product claimed to be. Fast, lag free and stable. The great thing about this product is that it eliminates the need to ever purchase a specific wireless adapter for your gaming console (i.e. XBox 360) or a wireless network card for your PC. Also the fact that this can be used across the various platforms (XBox, XBox 360, PS2, PS3, Wii and PC). The only knocks I had was the fact that the adapters did generate a fair amount of heat after the hour of gameplay. Makes me wonder how hot it would get after 2 hours of activity. Also, the size of the adapters could make it challenging to plug into an electrical outlet if you don't have a clear area around it. Finally, one item to note was that when we tried to use GameNet device in an apartment, we could not get a connection/configuration to occur. We believe this could be the case because the electrical wiring in an apartment is likely being shared amongst all the other apartment units within the build and thus the internet signal may not be routing to the other adapter. All in all, if you're currently using a wireless connection for your game console or PC and want something more stable, then the GameNet is definitely the solution for you. At a retail price of approx. $170 CAN, this is somewhat of a steep investment and would definitely be more attractive at about a $120 price point. That said I can still see a lot of gamers dishing out for this. NextGen Player gives the Corinex GameNet a NGP REVIEW score of 4 out of 5.